The Whale’s are here! 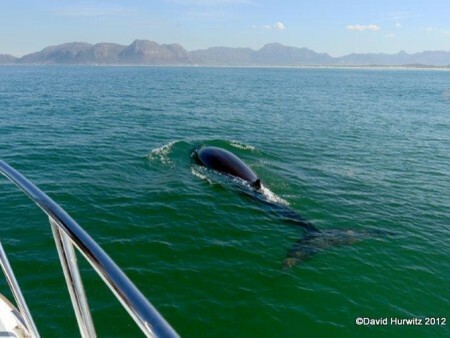 Since May we have had some distant sightings from the shore but as we cruise into the whale season in Cape Town there have been some regular reports from the whale watching boats and now we are starting to see them from the office and the coastline. Peak whale watching season is August – October every year. Here’s a mini guide to help you identify the whales that arrive on our shores by their tails! These are the most common whale sightings around the Cape. Their tail flukes are large and broad with a wide triangle with a notch in the middle. These tail flukes can be between 4.3 – 5.7 metres wide in adults. 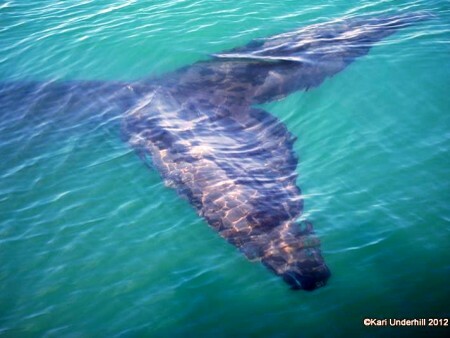 Southern Right Whales have no dorsal fin (no fin on the back) and they are almost uniformly dark (black) in colour. In terms of surfacing behaviour Southern Rights they will often lift their tails out of the water for long periods or lobtailing (lifting the tail out of the water then slapping it down on the surface of the water!). Southern Right Whales often breach as well (leaping out of the water). These whales are slightly smaller and often travel alone. They don’t dive about as acrobatically as the Southern Right and Humpback whales. Theirbroad centrally notched tail flukes never break the surface and are more easily identified by their broad head with many grooves and their prominent dorsal fin! So if you see a lonely sleek whale, swimming unobtrusively along it is more than likely a Bryde’s Whale. 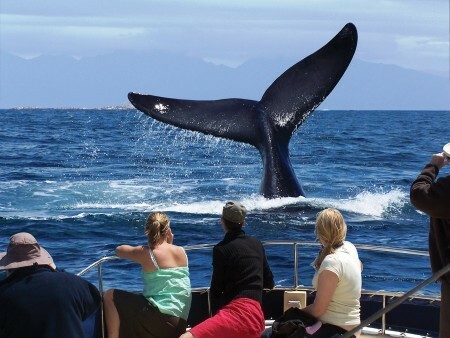 Whale Watching Boat trips in False Bay can be booked through Cape Point Route. Click Here for enquries. Please note that whale watching is seasonal and all whale watching boat trips are weather dependent. 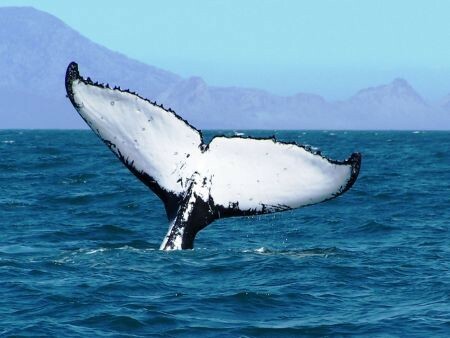 This entry was posted in Activity, Wildlife and tagged Boat based whale watching, Bryde's whale, Cape Town Whale Watching, Humpback whale, Southern right Whale, whale watching, Whales. Bookmark the permalink.